If you are sitting at a major or minor league baseball game when a rain delay is called, you’ll see the ground crew jump into action and within about 2 minutes the field has been covered — usually it’s made to look all too easy. But for those of us who have done it, we know how critical it is for everyone to work together to ensure the tarp is placed properly on the field. Soil and topdressing add weight to an already heavy full infield tarp. Whenever you dump a tarp in the outfield to drain the water off it, allow the underside of the tarp to dry. To remove the soil and topdressing that collect on it, fold the tarp in half and then open it back up. Repeat from the opposite side of the tarp. If done correctly, you will have a nice line of dried material that originally was stuck to the bottom of the tarp now in a windrow. Using a plastic scoop shovel, scoop up the material and return it to the infield skin or discard. To wash the large tarp, flip the tarp over periodically so rain can wash the underside of the tarp. Like I talked about in last week’s blog with the small tarps, repair holes as soon as they are discovered before further damage can occur. Clean the fabric around the holes thoroughly with soapy water or a very good household cleaner and allow the area to dry completely before applying a patch. Use patches that are round or with rounded corners to prevent being snagged or caught on something that could dislodge the patch. Apply glue if needed and use a quality contact cement to apply to both the patch and the area where the hole is in the tarp. Allow cement to dry so it is tacky and then apply the patch. Be sure to patch both sides of the tarp where the hole is for the strongest repair. One of the most dangerous operations a grounds crew can do is to deploy tarps in thunderstorms with strong winds. While everyone else scampers for cover, the grounds crew is thrust into action to attempt to deploy a tarp as a storm moves in. Here are a couple of cardinal rules to live by that will help keep safety as a priority. When high winds come in, keep the tarp as low to the ground as possible to try to keep the tarp from inflating. If the wind is taking it away and you have a hold but can’t control the tarp and it wants to pull you, let it go. Don’t risk a shoulder separation. If you let go, the wind will actually rapidly evacuate the bubble and deflate the tarp. You can then grab it and move it into position. These are not situations to be goofing around or being heroic. Be sensible. When deploying a full infield tarp in a hurry or dumping an infield tarp full of water, the air is your friend. Run or jog with the tarp to help trap air inside the fold. The air in the fold helps prevent the top layer of tarp from sticking to the wet portion of the tarp that is on the ground. When the tarp is full of water the air will also help to lift the tarp and dump it. With the tarp suspended in air, there is little friction, so the tarp easily floats along, making it easier for the crew to manipulate and maneuver. Obviously, throw this rule out when high wind conditions exist and control can be easily lost. There are many ways to anchor a full infield tarp. The most common would be using sandbags or tarp pins. More uncommon is using logs, tires and even field maintenance equipment. I have used tarp pins all through my 35+ year career, and only once has the wind ever taken that away. I prefer pins because you can carry a lot of them in your hand. This becomes important under really windy conditions. You can anchor the tarp very quickly using pins. Sand bags are all right except for the fact that they breakdown in the sun over time. You go to pick it up one day and the sand just falls out of the bottom. On top of that, you can usually only handle 2 or 3 at a time. I’m not a fan of using logs, tires, or especially field equipment to hold a tarp down. 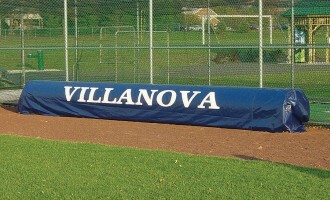 Equipment can be damaged if the tarp comes loose and slams in a piece of your equipment being used to anchor the tarp. With tarp pins, it’s just a matter of what the grommet interval is for staking and of course that is dependent on potential for high winds. 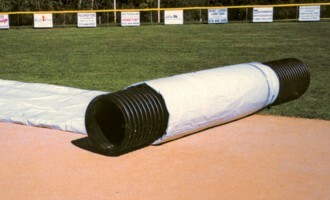 The best way to store a full infield tarp is by wrapping it around a piece of culvert piping. Most tarp tubes use PVC corrugated culvert piping in 24” or 28” diameter sizing which typically comes in 20’ lengths. I personally prefer the double wall culvert piping for structural integrity. The piping can be put together to make longer tubes. And with that said, the longer the tarp tube you use, the less you have to fold it. And the less you fold a tarp, the less drag you create from trapped air in the folds, thus making it easier to roll-up or deploy. 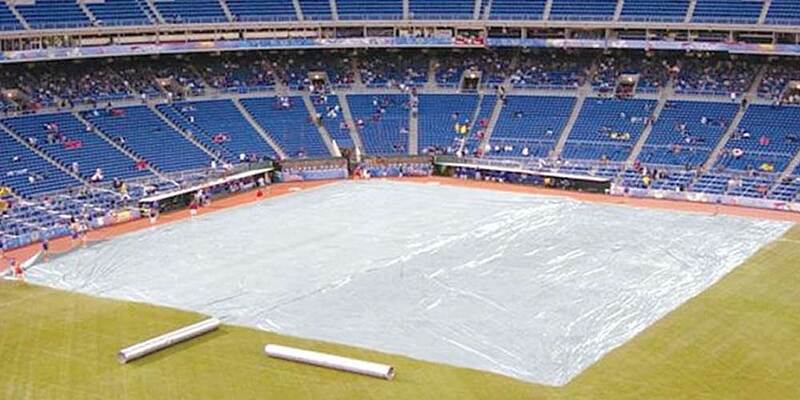 I recommend a minimum tarp tube length of 40’ for any infield tarp no matter the size. A tarp tube cover is also beneficial in keeping the sun from beaming onto the rolled up tarp and breaking down the material that is exposed to it at a faster rate than the rest of the tarp. When stowing your tarp, fully dry your tarp whenever possible to 1) lighten the weight, 2) ease of folding for stowage AND unfolding for faster deployment, 3) reduce incidence of mold and mildew, and 4) keep the smell down. Obviously drying a tarp in a game situation is not possible. Stretch out the tarp when ready to fold so there are few, if any wrinkles. Begin by folding in half. If the tarp is wet when folding, pump air into it while pulling the fold over. Once you have folded the tarp as many times as you need to have it fit the tarp tube, roll the tarp tube down the length of the folded tarp to evacuate the air trapped inside the folded tarp. This will reduce the drag when you roll the tarp onto the tube. 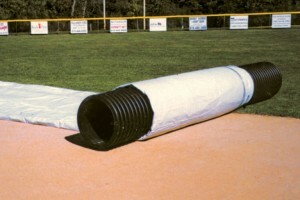 Finally, line up the tarp tube with the folded tarp and roll up, keeping the roll as straight and tight as possible. A loose tarp roll greatly increases drag, requiring more work to deploy it when needed. Full infield tarps are some of the best rain insurance you can have for a field, but it requires a trained staff that is aware of the dangers and knows how to adjust to rapidly changing conditions. This is not a job for volunteers who are unaware of potential issues or dangers. Back in 1988 while I was working an Orioles-Seattle Mariners game at old Memorial Stadium in Baltimore, my crew was dumping a rain filled infield tarp to the outfield in front of about 30,000 fans. One of my tarp crew members, a healthy and athletic 17-year-old, suffered a heart attack right on field in front of the fans as we were dumping the heavy rain-filled tarp. Fortunately, we were able to resuscitate him after working on him for 10 minutes or so. It was later found that he had a heart murmur that had never been picked up in prior physicals. He has lived on to tell the story many times thanks to a pacemaker. We make it look easy in the big leagues, but if you are an organization that owns one, be sure to provide plenty of training and practice in various situations in handling these labor intensive products.